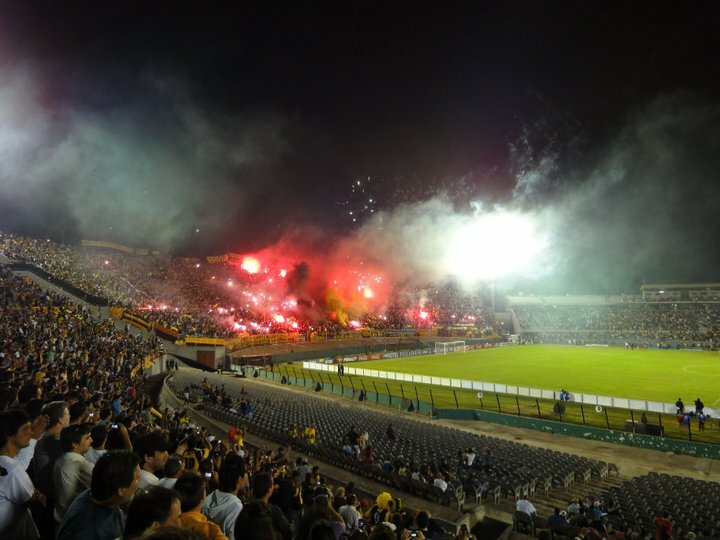 We arrived in Buenos Aires on a Sunday afternoon. As our hotel was located in the older part of the city in San Telmo, we were a stone’s throw from the famous Sunday market that takes place along one of the neighbourhood’s many cobbled streets. The fair featured stall after stall of traditional antiques, leather goods and artisan crafts, though it is on the verge of becoming a typically commercialized attraction in which the majority of what is on offer consists of t-shirts, wooden mugs for mate, smoking paraphernalia, custom wine bottle holders, and other cheap, tourist-oriented kitsch. The atmosphere was fun, crowded, and noisy, with street performers of all kinds competing with the noise of various versions of Depeche Mode and Sting songs rearranged as tangos (very weird) and the occasional shout of a tourist discovering that his wallet had walked off with a local. Roving bands of drummers paraded up and down the street, drowning out all other sounds and sweeping everyone up in their rhythm. I even saw the elderly couples who had been dancing tango in the market’s central square stop for a moment and unconsciously move their heads and hips to the drumbeats. Later that night, we discovered that the crowds had masked sidewalks that were filthy and falling apart, littered in feces and crawling with cockroaches, and so uneven that taking one’s eyes off them would make tripping every three steps a certainty. Perhaps, again, this is what they mean by “bohemian,” or “full of character,” in which case Buenos Aires certainly qualifies. It is European in style and influence, but I found it lacking the sparkle and excitement of European cities. It felt run down, in disrepair, tired. More than anything else, I was saddened by what I found there. Everywhere there is the feeling of former grandeur in gradual and unimpeded decline. Blocks of high rises with stunning turn-of-the-century beaux-arts architecture are shuttered with security fences and alarm systems, or crumbling and “undergoing refurbishment” (for decades). Almost every public monument – and there are many – is closed off to the public with a high, permanent fence, and visually marred by layers of graffiti. 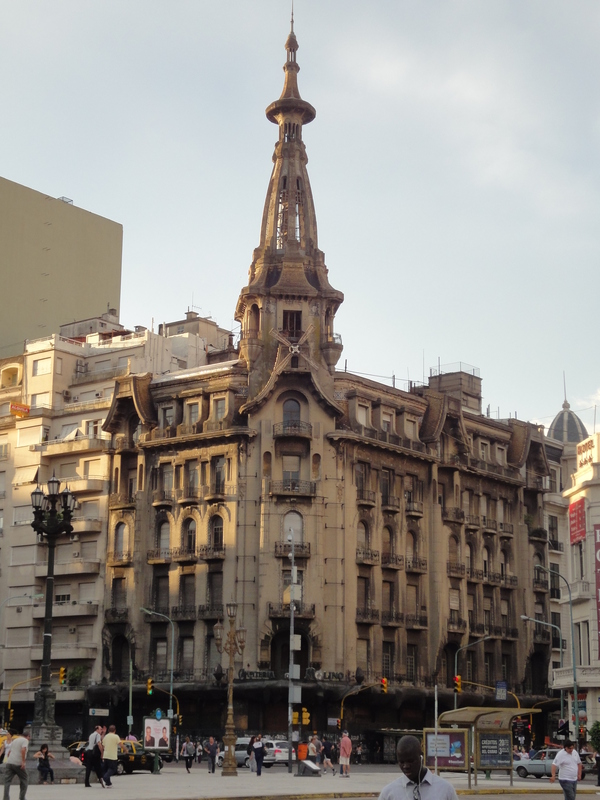 A tour guide explained that Buenos Aires had been a wealthy city in the late nineteenth century, and underwent a building boom at that time, but when the global market crash hit in the 1930s, many families lost everything and their homes have never been cared for since and have fallen into disrepair. 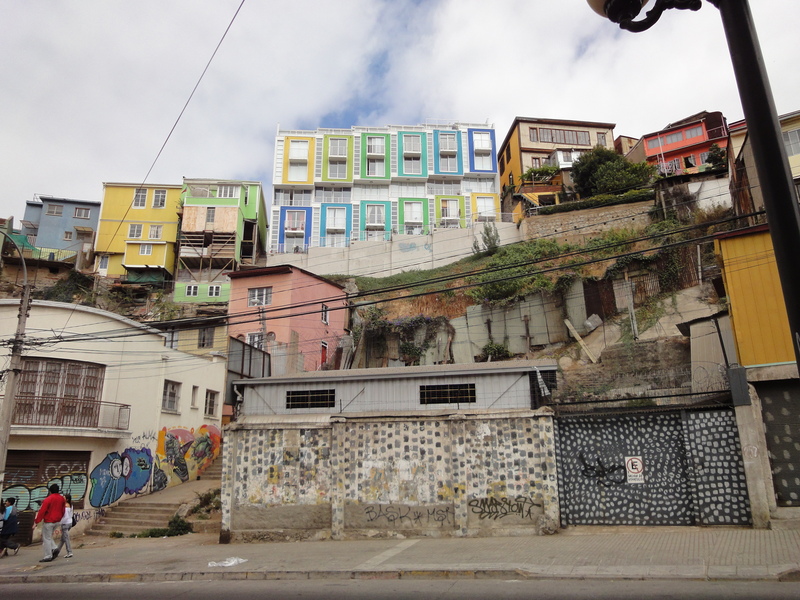 The exceptions are the ones that were adopted by the government and turned into state buildings – but they certainly do not escape the graffiti treatment that is near-ubiquitous across the city. As a whole, Buenos Aires looked as saggy and tired as an aging tango dancer, still wearing the revealing, sparkly dress and 4-inch heels of days gone by, but gradually slowing in her movements and with a little less of the famous kicking. The locals seemed to echo my sense of disenchantment. Everywhere we went in Argentina, there were complaints about the interference, partisanship, and general ineptitude of the government led by Cristina Fernández de Kirchner. Its latest schemes include firing chemicals into the clouds to break up hail in Mendoza (Cloudbusting, anyone? ), switching the capital’s coin-driven bus system to one with cards (as they already have in Santiago – but here already a year overdue with no apparent progress), and making the banking system more stable. (Incidentally, while we were in Buenos Aires a bank robbery caused a run on banks that meant we had to go to four different bank ATMs before finding one that had money left to dispense.) 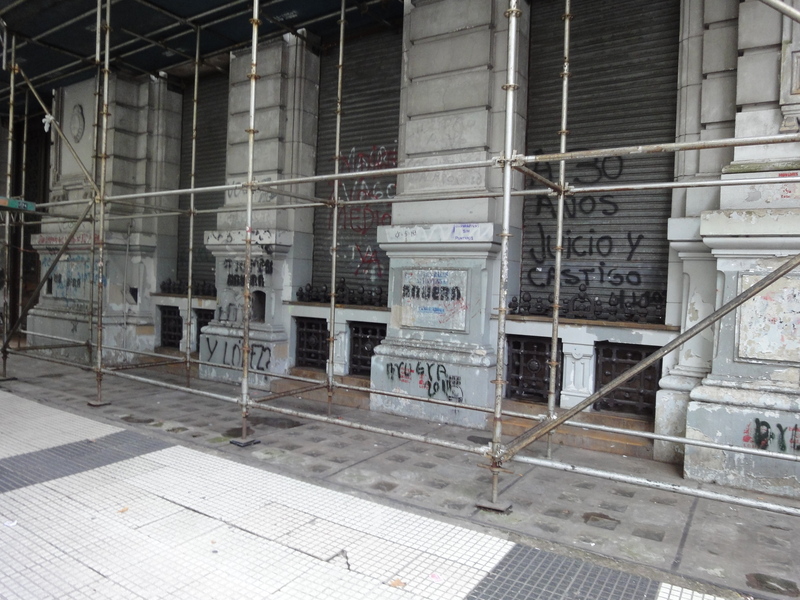 Where in Chile there was hope and excitement about the future, in Argentina and especially in Buenos Aires we found a general sense of pessimism and hopelessness that matched the state of the city’s once-great buildings. I recalled that in The Economist‘s “The World in 2011” publication, the South American leader chosen to expound on the hopes for the future of a continent that has not lived up to its potential in the past 200 years was Chile’s president, Sebastián Piñera. Kirchner is up for re-election in October. I asked one of our tour guides who she thought would win and she shrugged hopelessly and said that even though nobody likes the president, she would likely be re-elected because the opposition is in even worse shape. 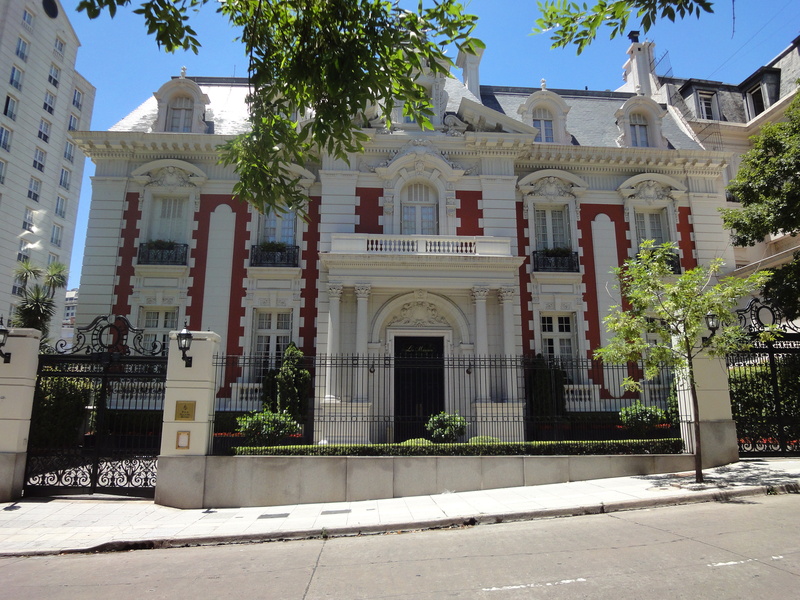 A beautiful mansion, now part of the Four Seasons Hotel, in Recoleta. Note the sidewalk. And yet, like the aging dancer, the city still has its charms. 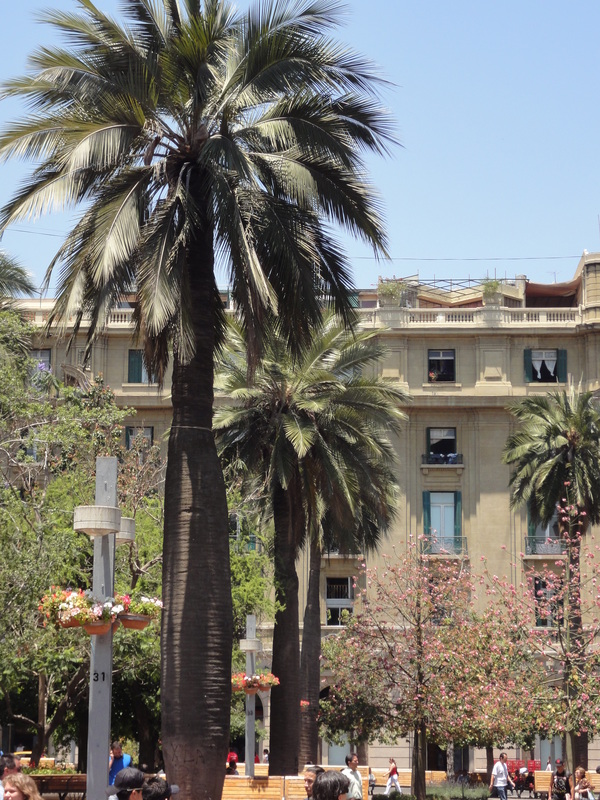 The upscale neighbourhood of Recoleta features beautifully kept mansions and intact sidewalks (a novelty), as well as wide, tree-lined avenues. Puerto Madero, the old port area that has been completely revitalized in the last 10 years with hundreds of condos, restaurants, and pedestrian paths, has the feel of any world-class, modern city. 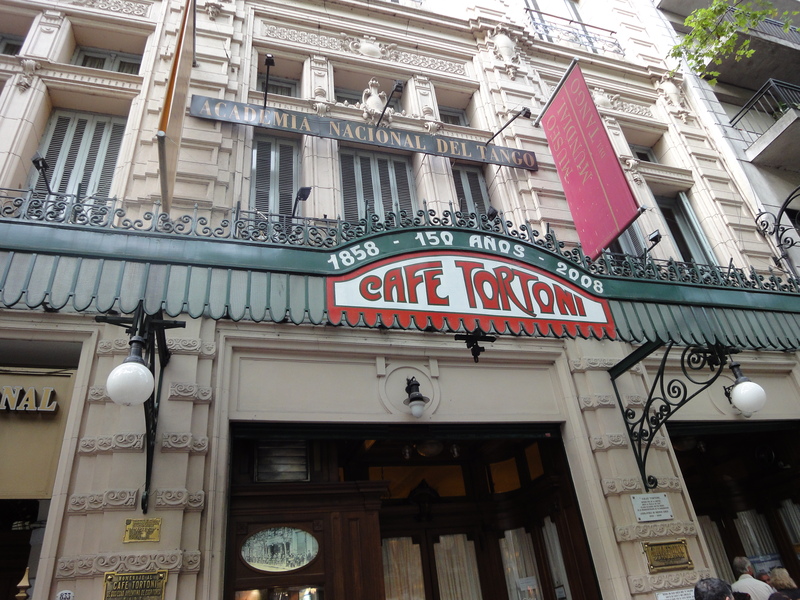 The historic cafés and restaurants we found all served excellent food, and with their wooden tables, tango posters, and colourful clientele, it wasn’t hard to believe that they really hadn’t changed much in 100 years. The wine flowed freely, the people were interesting and friendly, and the weather was warm and breezy throughout our stay. And, of course, there was the tango itself. It is a dance of anger and sadness, and it fits the city well (even though I must note here that Montevideo, across the river in Uruguay, claims to be the city in which it was born). One hears the tango everywhere, from street musicians to cafés to the radios of taxi drivers. And people really do dance in the streets. We saw a tango show that was about as touristy as we had predicted it would be, but that was nonetheless an impressive display of athleticism, beauty, and styling gel. We took a tango lesson from a local, which was more focused on our working together as a couple than the steps themselves, which indicated to me how much more the dance is about feeling and style than it is about technical mastery (those famous ankle-over-the-shoulder kicks notwithstanding). And, on our last night, we went to a real-life tango club, nestled deep in the stylish neighbourhood of Palermo Soho. The crowd was mostly in their middle age, though we were by no means the only young people there. All the women, regardless of age, wore very high heels and very clingy dresses. The dancing was beautiful – not showy, or technically perfect, but full of emotion. Couples would regularly switch partners, and spend almost as much time talking and laughing as dancing. I liked this side of Buenos Aires, the part that wasn’t posturing for tourists (and often failing to impress), but that showed off the still-vibrant core made up of the people who live there. I would return to the city for this feeling, one I still can’t put my finger on; Buenos Aires, despite my disappointment, still fascinates me because I felt as though history was alive and ever-present there, in the fairs and the foods and the tangos. There is still the porteño spirit in the air that was once behind all those buildings and monuments. I think the city is too proud and too fiesty to stay in decline for long. There is an Andean crossing through Patagonian splendor that several guide books have described as one of the classic border crossings in the world, and one not to be missed. In fact, Hubs and I planned our whole month in South America around taking this trip through mountain lakes, with volcanoes towering above the water, and beauty all around. For the relatively steep (for South America) price of $250 (USD) each, it promised to be a luxurious experience. 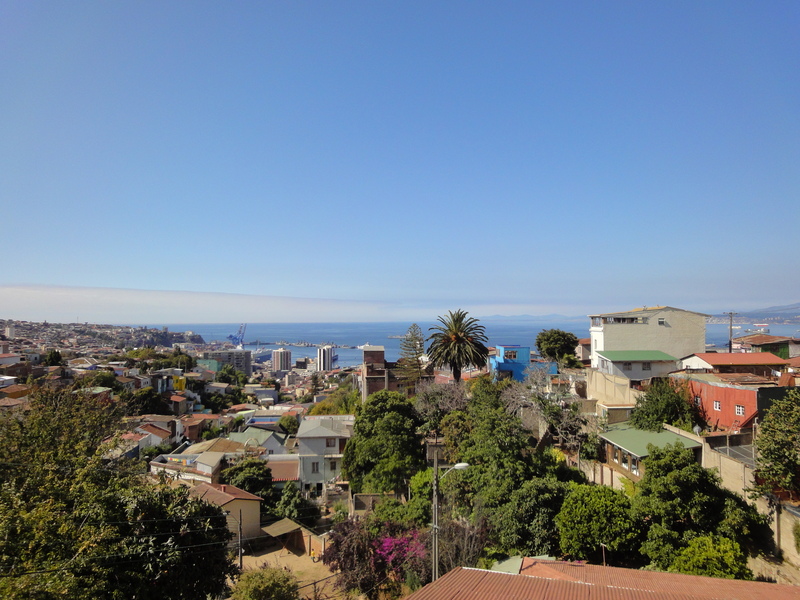 So it was that we found ourselves taking two flights, one from Mendoza to Santiago over the Andes, and one to the small city of Puerto Montt in the south, which many people have described as Germany in South America. The city, and its Argentinean mountain counterpart, Bariloche, were settled by German immigrants in the late nineteenth century, so the homes were in the German style of that period. In truth, I found this comparison a bit overstated, as the vegetation looked exactly like twice winter Olympic host Lake Placid, in upstate New York, and the people looked very similar to Santiagueños. My suitcase was the very first one on the belt, though, which has never happened to me before – German efficiency, perhaps? 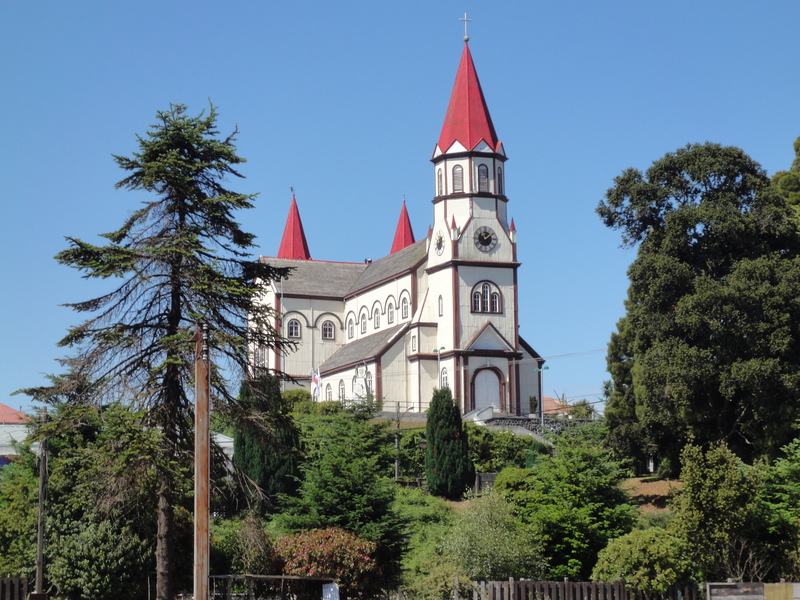 The Catholic Church in Puerto Varas - okay, this looks a bit like Germany. 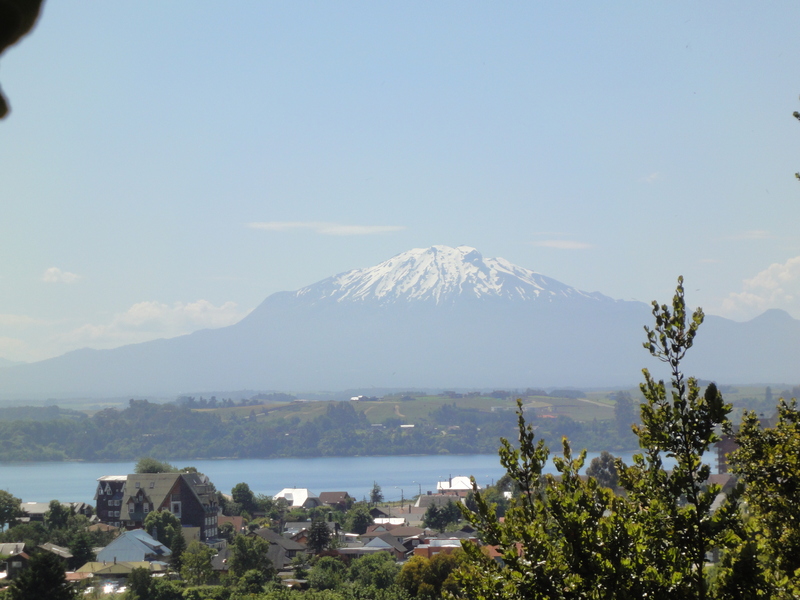 Our final stop in Chile this trip was Puerto Varas, an even smaller city about a half hour from Puerto Montt, on the edge of a mountain lake overshadowed by towering volcanoes. The owner of the B&B we were to stay at for 2 nights was originally from Indiana, and had a kind of cool arrogance that reminded me a bit of Clint Eastwood in Dirty Harry. He had originally come to the area to fish for several months in the early ’70s, and stayed after meeting his Chilean wife, who was lovely. He was quite the outdoorsy type, and I could tell that Puerto Varas was the perfect place for those who liked to hike, row, fish, camp, zip-line, and otherwise do things I’m not usually involved with in any way. We ignored all that, though, and spent the day exploring the town and drinking a bottle of wine from the finca of our cooking class on our hosts’ beautiful porch, surrounded by towering plants and flowers in full summer bloom. It was to be the calm before the storm. The next morning, we awoke early enough to catch the bus that would make up the first leg (of 7) on our third and most anticipated Andean crossing, this time through the lakes. The “cruise,” as it called itself, consisted of 6 or so actual hours of moving, yet it took about 12 hours total to get from our starting point in Chile to the final destination across the Argentinean border. The remainder of the time was spent waiting: waiting to get on busses, waiting to get off busses, waiting for the busses to start moving, waiting at the border crossing, waiting for the boat to arrive…and waiting the whole time in an unexpected heat wave with no air conditioning anywhere and hordes of other travellers, mostly Brazilians jabbering in Portuguese, and most with screaming toddlers in tow. Sweat was pouring from us all after about 30 minutes. Glass rooves intensified the greenhouse effect of the sun. We wilted. On the bright side, the scenery was beautiful. For lunch, we stopped at about the halfway point, high in the mountains. There was exactly one place to eat, a hotel restaurant of mediocre quality and elevated prices, and about 500 travellers going in both directions who descended on the restaurant all at the same time. Finding a table was difficult, and getting everyone served and out in less than 2 hours proved impossible for the staff – we had to leave what we thought was adequate payment on the table, having waiting for our bill for about 15 minutes to no avail. I couldn’t understand. Don’t they do this every single day? Little did I know that the meal would prove the high point of the day. The next leg of the journey – in a decaying bus up several hundred feet of loose gravel mountain road – was enough to make anyone feel queasy, even people like me who never suffer from any kind of motion sickness. The road was for exclusive use of the tour company, which meant it was the exact width of the bus – no more! – with nothing in the way of guard rails or anything else to prevent us tumbling down sheer mountain drops as we lurched backward and forward. The air conditioner was dripping in a steady stream from the seats’ light apparatuses onto several passengers, and the massive bumps we were driving over would cause it every so often to run almost horizontally and soak the windows. All the while, someone (our tour guide?) was whistling loudly, as if in defiance of the utter terror of the journey. The Andean bus crash scene from the beginning of the movie Dragonfly was playing over and over in my head and I tried to position myself where I thought it least likely a window would shatter on my head when we hit a piece of mountain. And, in my own personal version of Hell, there were the flies. At every point, including while on the water, swarms of blackflies and horseflies intent on a piece of flesh would go for the passengers. The latter were about 3cm long and 1cm wide (i.e. REALLY BIG), and would buzz around angrily in droves – at one point, I was swatting away 20 or so simultaneously. It was the stuff of nightmares and horror movies. Several of the women were in hysterics (I don’t exaggerate here; full-on hysterics) and with full disclosure, I’ll admit that I was one of them. When we arrived in Bariloche, Argentina, our final destination, at about 8:30pm on New Year’s Eve, I could confidently say that the day had been one of the worst travel experiences of my life. $250 each? You couldn’t pay me to do that again. Luckily, Bariloche provided some much-needed respite and lived up to its reputation as the land of artisan chocolates and beers. We spent much of our 2 days there recovering, but found time to visit two craft breweries just outside of town, which supplied us with some good brews and tasty food. The town itself is odd, a kind of commercialized outpost at the end of the world, full of young people out to party and hippie beach bums and ski bums with dreadlocks looking to get lost for a while. 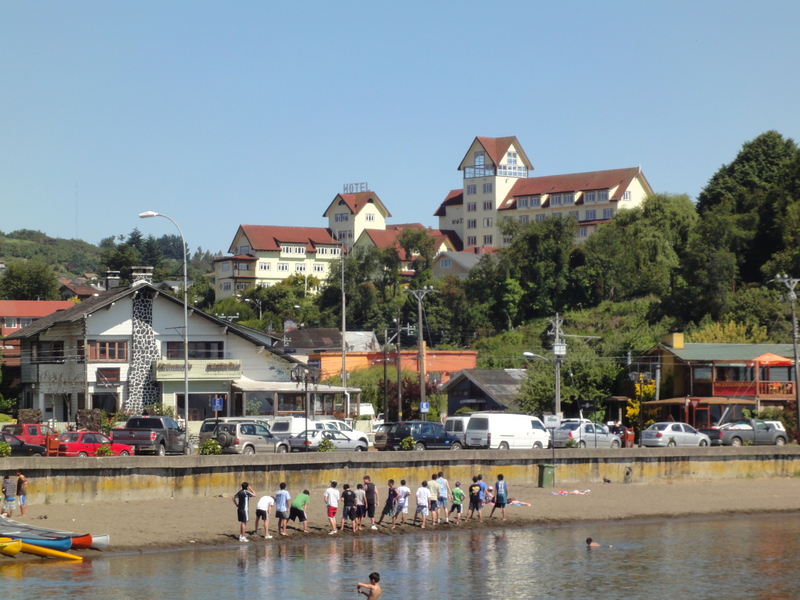 The average age of the tourists – and it felt as though the town was all tourists – was about 23, and it was a much more cosmopolitan mix than we’d seen in Puerto Varas. (There were actually a few people my height, which I hadn’t seen since leaving Canada.) Bariloche is supposed to be the “Switzerland of the Andes,” which I suppose I can imagine, if Switzerland is full of kitschy shops in which to buy sweaters and baseball caps. And chocolate shops full of men in lederhosen uniforms. The little log cabins that dotted the shoreline were quite beautiful, and I’m sure it would be a fantastic place to go in the winter to see in its skiing glory. 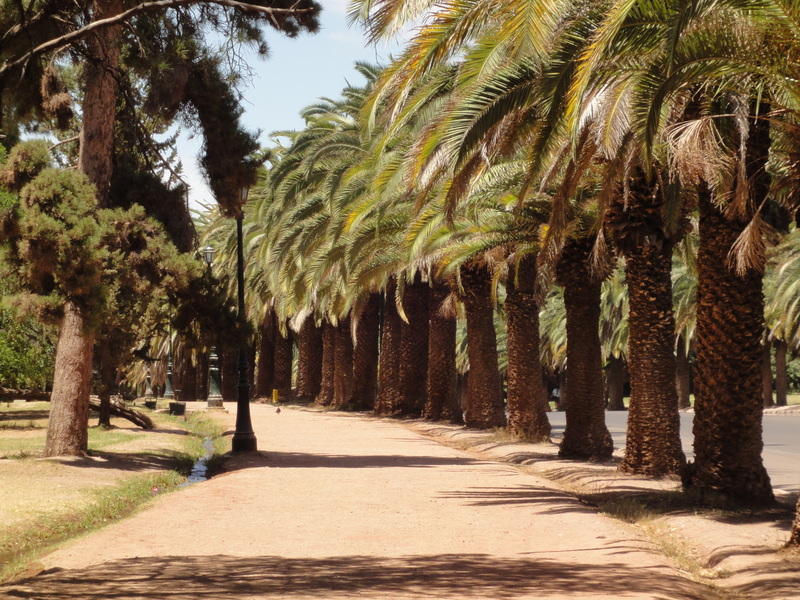 As it was, the unanticipated heat made the miles of beach more appealing, but we could not tarry, as a (typically, delayed) flight to Buenos Aires was waiting. Would it turn out to be the magic land of Parisian architecture, fabulous steaks, and tango dancing in the streets that we’d heard of? 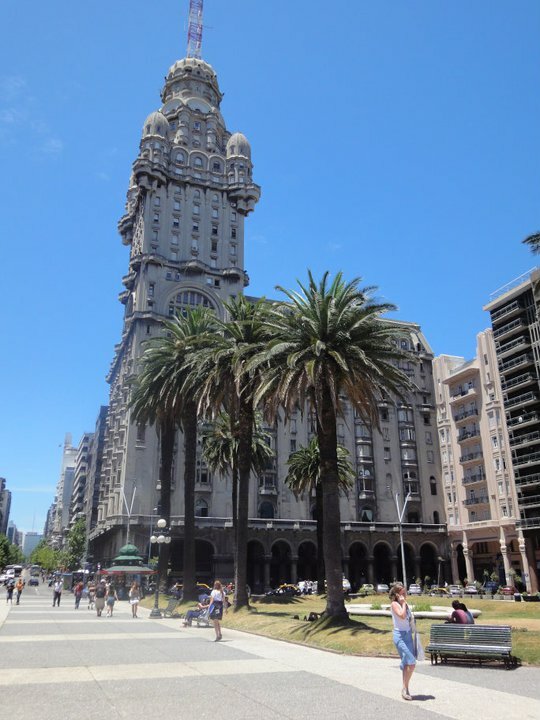 Would there be tourists everywhere seeking Evita-related history? Would I have to opportunity to growl at Maradona in person? Stay tuned! There are certain assumptions we make about Paradise, depending on our own tastes and inclinations. Perhaps it is warm, maybe even hot enough that anything but sleep is uncalled for between the hours of noon and 5. Perhaps it abounds with flowers and leafy trees to shade weary travellers as they wander its sun-dappled streets. Certainly, it is comfortable, a place with king-size beds, faucets that shower water of even temperature and pressure, and pleasant aromas inside and out. So it is with Mendoza. I will admit to having had lingering concerns about how I would find Argentina and its people, bourne from some unfortunate incidents in ’82 and ’86, but, unsurprisingly, they proved unfounded, as everyone was both incredibly friendly and easily understood (another concern). An enormous fresh fruit salad appeared minutes after our arrival at our delightful B&B at noon on Christmas Day, courtesy of the friendly proprietor who had interrupted a several-hour-long lunch with friends to let us in. And what a B&Bit was: an ultra-modern oasis of polished concrete floors, air conditioning, and soothing tribal music playing at low volume in a common area I would immediately move into as my own condo if given the opportunity. And the stylish surroundings were no match for the people, who all appeared to have walked out of a fashion magazine. Even the taxi drivers wore collared shirts, and women everywhere were in sparkly sandals and dresses with plunging necklines. 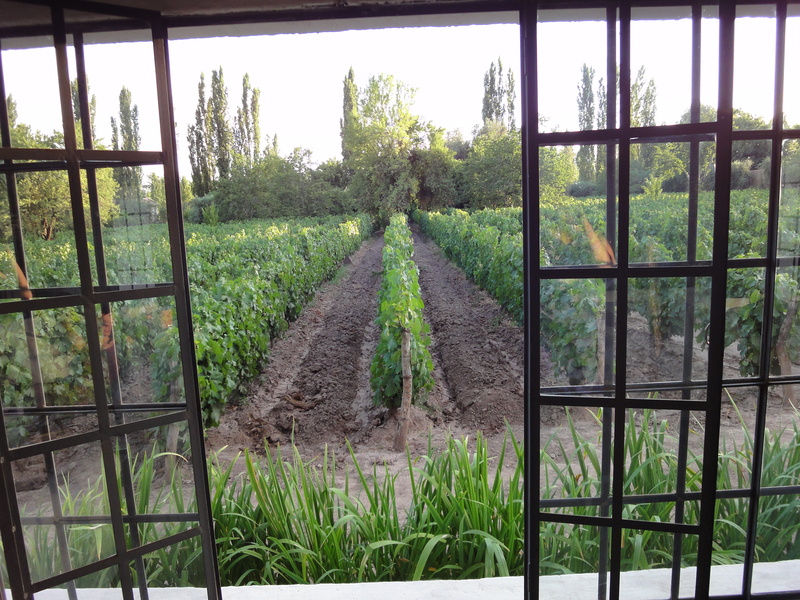 A finca in Mendoza - what more could anyone want? 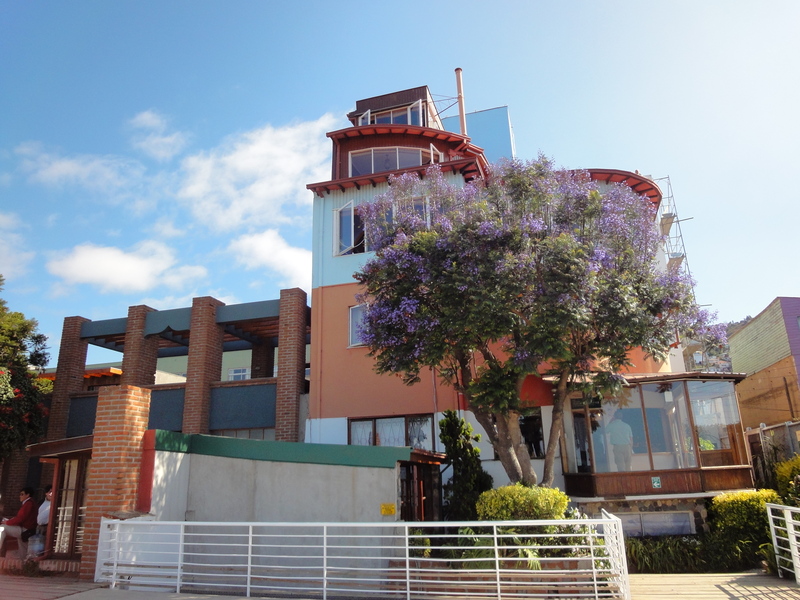 If Chile is North American, Mondoza is European enough to serve as the setting for the Italian parts of a Godfather movie. Outside the city, row upon row if grape vines stretch into the distance, broken up only by the occasional olive tree marking the boundary line of one finca from another. Restaurants augment their fabulous meals of stuffed pasta and gigantic steaks with house-made preserves, wines, and olive oils, the latter often stored in large barrels behind the bar. I’ve not been to Italy or to Paradise, but I imagine they look, feel, and taste a lot like this. After a 6-hour bus ride through the Andes, with switchback after switchback, we spent two days dozing intermittently and exploring the city’s massive pubic park and many public plazas (named after important friends, founders and neighbours like Chile, Italia, Peru and San Martín). On day 3 we explored three ultra-modern wineries in the nearby Uco Valley – with 6 other tourists and a guide company, as numerous private security firms and local custom prevent Napa Valley-style exploration by individuals or couples on their own, whether by car or bike. Each bodega was less than 10 years old, and each was owned by wealthy foreigner who had invested significant cash to turn what was essentially desert into microclimates suitable for many varieties of grape. The wineries themselves were towering concrete monuments to efficiency of production and the power of modern science in vinticulture – all sterilized labs and no romance here. 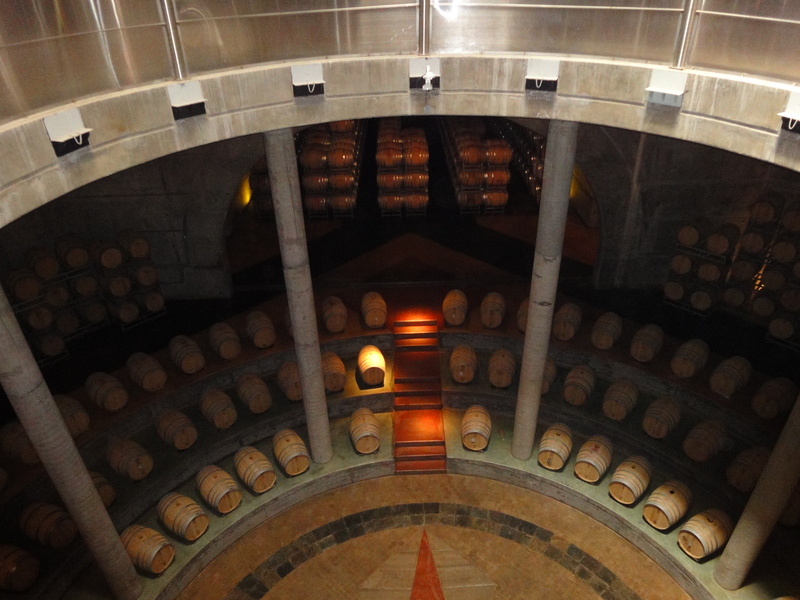 It seems that Mendoza is quickly becoming a hotspot for wine tourism, and its winery guides, fluent in English and with pleasant (if slightly indifferent) hospitality, show that the people know it. Being by far the least experienced wine tasters in our half-American, half-Canadian group, we drank our 12 (!) tasting glasses with increasing delight but little in the way of critique. Our best evening was spent at a small finca (the term for the kind of property on which grapes and other Mediterranean-type crops are grown here) at a cooking class with a lovely young chef who had returned to Mendoza to raise her two daughters after a stint in one of Santiago’s chic restaurants. Sitting outside, under a walnut tree and a sky full of stars, drinking the finca‘s own red wine (made exclusively for guests of the attached lodge and cooking class participants), we had our best meal to date in South America. It consisted of empanadas (folded meat pies) in the local style, grilled vegetables, a giant steak (of course; this is Argentina), fruit cooked in a clay oven, and – best of all – chimichurri sauce made from fresh herbs and oil. Finally, spice! I’ll admit that even my tastebuds, so inclined toward bland meat-and-potatoes types of foods, were crying out for some kind of flavour (even pepper, which South Americans don’t seem to believe in). It was heaven itself, for despite all the talk of ubiquitous, 21-ounce steaks (and it was not exaggerated), we have found that many places serve cuts inferior to what we’d find at home, and many are fried instead of grilled. They seem to value quantity over quality in many places. And bread and fries seem to be the only accompaniments worth getting, as the salads are vegetables are all quite sad looking. It is perhaps good that I have been remiss in writing much of our travels in South America thus far, because it is only since we arrived in Argentina yesterday that I am able to speak of the differences between it and what we have seen in Chile. It is almost as if we have traversed three continents in our travels, instead of just two countries. We first wanted to come to South America — to Argentina specifically — because we had heard that it was the “perfect European honeymoon, at half the cost” (or twice the length, as we are doing). Everyone told us that the architecture, the culture, and the people would seem strangely European as well, but with the added advantages of massive steaks and tango dancing. What more could one ask? Nada. Arriving in Santiago to 33° weather, we certainly felt that we were somewhere very different. 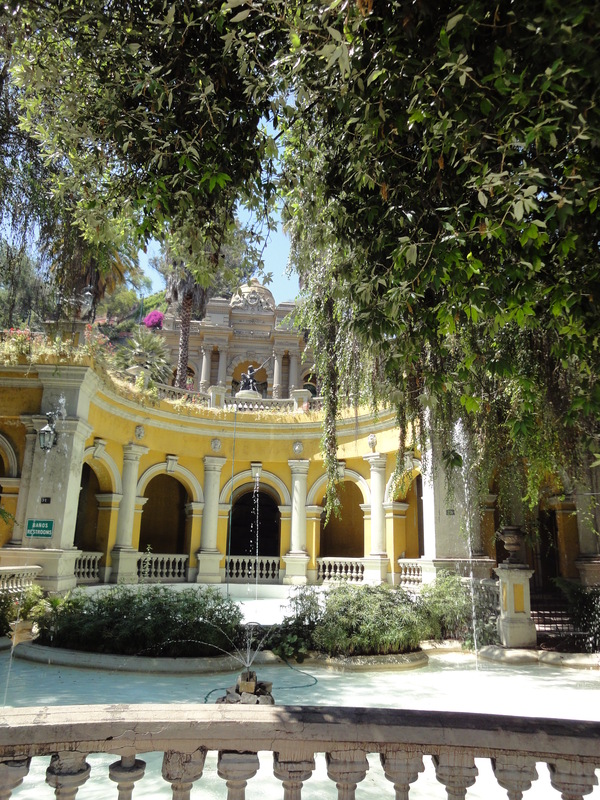 Santiago is a lovely city, with colours bursting from the trees and plants that line its almost exclusively one-way streets, beautiful homes and gardens, and kind people who help point lost turistas like us in the right direction. It is very clean and feels safe, despite the high walls and security gates that front every property. We stayed in the delightful, modern neighbourhood of Providencia, in a beautiful B&B run by Chileans who had lived for years in New Zealand and Australia, and who were willing to speak to us for hours with pride about their country’s history, politics, food and drink (which is fantastic). Their wines are very cheap at about $5 a bottle and top-notch, especially a new variety of grape we have discovered called Carménère, which was originally from France but has since disappeared there only to flourish in the temperate climate of Chile’s central valley. And the bread. Oh, the bread. It is shaped like a French roll, with the crustiness of a baguette, and is so delicious that it is consumed at every meal, with jams, fruits, cheeses, meats, and butter, or simply on its own. Everybody in Chile eats it, and so the government regulates its contents, legislating added vitamins to ensure that it is healthy. But it is not Europe, something we only discovered after a day or two when we realized what it was that had been in the back of our minds and could put it into words. In fact, we found, putting aside the weather and all the associated effects of living life outside more, that it was very much like Toronto. It was jarring to be in a place so foreign to us and yet in many ways so familiar. Part of being a tourist and adopting, as many scholars have called it, the “tourist gaze,” is constantly comparing how the things we see are similar to and different from home. As tourists, we adopt a position of ignorance by necessity, simultaneously resenting and hiding behind our feeling of being outsiders. Most tourists want to live “as the locals do,” and spend a few days living a life that is not theirs, but it is always difficult to overcome differences in language or customs and really understand. We of course were no different, and in seeking to understand we could not help but try to find the gaps between our assumptions of the country and the reality. On our third day in the city, we took a bike tour in the afternoon heat, called “Parks and Politics,” led by a travelling American from Colorado (younger than we are) who had lived in the city but three months. Not exactly what we had expected, but he was knowledgeable enough and, unsurprisingly, spoke English that we could understand. It seems many Chileans don’t speak it at all, so he had managed to secure the job easily. The tour involved battling rush-hour traffic (at Christmas) through the downtown core, and I will mention that Toronto bikers should come to Santiago if they want to see what a city that has no bike lanes feels like. 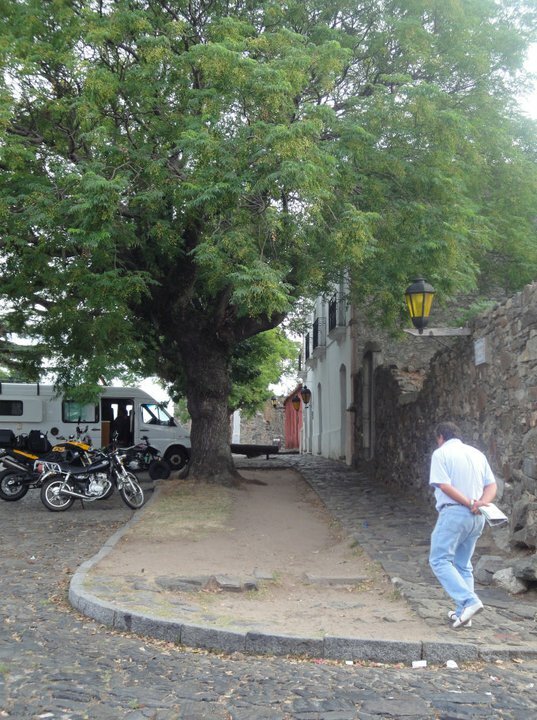 (Incidentally, the suburbs and neighbourhoods outside of the central area all have dedicated bike paths, but in the city proper we were on our own with only our large bicycles, bells, and evident tourist status to shield us from the simultaneous aggression and creative response to red lights of Santiago’s drivers.) Again, it was much more American than European. 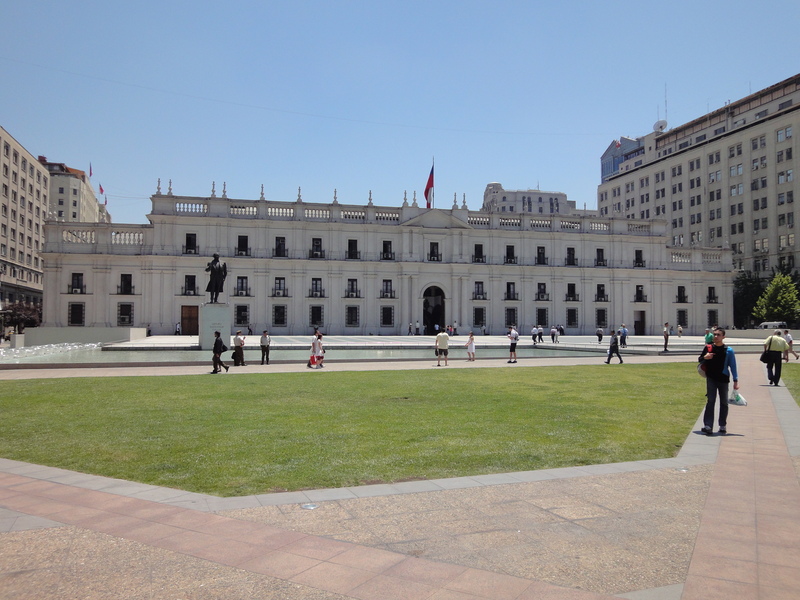 The buildings, many of which had been rebuilt after each of the earthquakes in Chile’s history, stood firm but looked modern, with a few exceptions (the national library, some government buildings, universities) which were in a slightly crumbling colonial style. Our guide explained that the drivers would be kind to us because they would see that we were tourists and would simply be glad that we were there and not in Argentina. I felt that this was likely a more honest statement than we would get from a native, and a telling one too. We did not know what to expect from Chile before we came, and when we told people about our trip, they would mostly only comment on Argentina and all its charms. 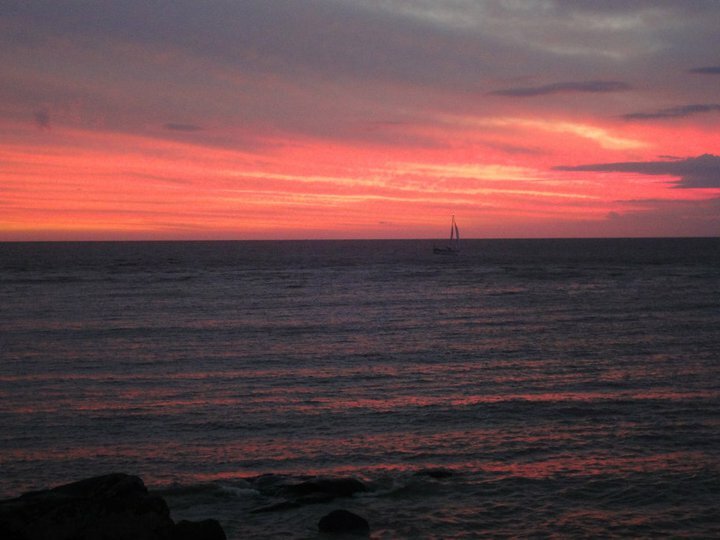 It seems that Chile has only recently become a destination for those who enjoy world-class travel. In the 20 or so years since it secured its democracy again after years of military dictatorship, it has made great — and oft-unremarked — strides. It has a booming economy, buoyed by copper exports (recall the famous miners) but also fabulous produce and wine and specialty crops like jojoba beans, which are apparantly much used by NASA as well as in skin creams. (I can’t speculate as to why.) And Chile is now a country with an immigrant population, which is presenting a host of new problems and some national reflection that had never occurred before. The influx of Peruvians has apparently sparked a wave of protests that labour is being ‘stolen’ from native Chileans, one that is quite familiar to us in North America and Europe. The city of 7 million, surrounded on all sides by stunning mountain ranges, and already home to 45% of Chile’s population, will have to determine how to grow yet more as it becomes a more attractive place to live. I suspect in some ways that Chile’s relationship with Argentina mirrors that of Canada and the US: part admiration, part resentment of its history as a greater world power, and a small part humourous derision – of the vast amounts of food (not a problem for us), of its famed Mendozan wineries being owned by Chilean companies, and of its people being poorer generally, thus explaining how Argentina came to be “cheap” compared with Chile (we got the double meaning of the word). Perhaps they are small victories secured to compensate for a history of being looked down upon by visiting Argentinians, or ignored entirely, or perhaps we will discover some of them to have merit. Note: Please excuse any strange formatting, small fonts, and the lack of pictures. All to be rectified once I find a browser that cooperates with me.